I love really old "how to" books and recipes. I also love American History and so when I come across books published in the 1800's I am in heaven! I'm currently immersed in a book about pretty much anything and everything to run your household circa 1874-ish and I'm LOVING it. SO much knowledge and information that has been lost over the years! These books are being sold and thrown out from dis-use as they gather dust and no one checks them out in libraries, and can't be found by word and phrase searches on the internet because they are not electronic. They can be found in internet archives, but the pages have been scanned (photo copied) for download and you literally have to look at the image of the page to read it... so no 'google' search will find the information. Therefore - not too many read these books. And they have awesome 'homemade' recipes for everything them! 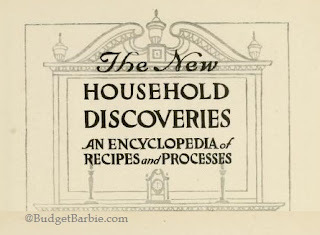 The series of books I really appreciate is the Household Discoveries series. A no-nonsense, easy to read and follow, common sense style of writing that delivers so much knowledge and information! This series was updated and revised every few years and although I lean heavily towards the 1874 published version, I also have other versions published up to 1908. You can get this through Amazon in a hard copy version (I believe it may be a print-by request version?) As of this morning it's listed at about $60, which is pretty expensive considering you can download the book for free to your electronic reader of choice from archive.org. I thought I'd post some of the information here for my own use, but some readers might find it interesting, helpful or entertaining as well. The main object of this book is economy. If rightly used, it will save a great deal of money in every household. It will also save time and labor, which are the equivalent of money. The publishers have long felt that there is a great need for a new book of this sort upon the market. To be sure, there are a number of standard dictionaries and encyclopedias of appHed science. But these cost from five to ten dollars and upward. And they contain a great deal of information about commercial processes not suitable to household use. There are also a number of popular books of recipes published. But most of these are old books. Others are made up scrapbook fashion by the republication of old material without proper editorial supervision. In the course of the preparation of this volume, our attention was necessarily called to the fact that a number of so-called " new" books republish, word for word, recipes and processes that have been formerly published in six or eight other books, some of which appeared before the Civil War, Recent science has introduced many new substances and processes then unknown. All these have been availed of in the present volume. Moreover, the old-fashioned popular book of recipes leaves something to be desired in its manner as well as its matter. The enormous sale and reputation of a number of old books that contain some recipes of great practical value, but accompanied by comment which no sane person can possibly read without a sense of humor or a feeling of disgust, is the strongest possible evidence of the value of this kind of information. We believe that what has made these old books popular is their practical part and not their silly part. We believe that the public will approve a volume that sets forth what to do, how to do, and the reasons why, in simple, direct, and dignified language, and saves space for additional recipes and other information by omitting " horseplay " and all mmecessary remarks and commentaries.